Hawai`i yellowfin tuna will be one of the topics of the Fishers Forum at Harbor View Center on Oct. 21. Photo courtesy of David Itano, a Fishers Forum presenter. HONOLULU (16 October 2014) The public is invited to attend the Fishers Forum on Hawai`i yellowfin tuna and North Pacific striped marlin and view a sneak preview of ‘Ahi–The Yellowfin Tuna. This short documentary focuses on the importance of the species and research on the local stock that may have important management implications. This family friendly and free event will be held Oct. 21,2014, from 6 to 9 p.m. at the Harbor View Center at Pier 38, 1129 North Nimitz Highway (above Nico’s restaurant). This Fishers Forum is presented by the Western Pacific Regional Fishery Management Council and will focus on two fish that are very popular with consumers in Hawai`i: yellowfin tuna (`ahi) and striped marlin (a`u or nairagi). 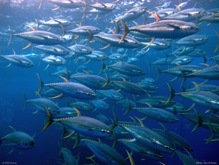 Yellowfin tuna is a species targeted by various fisheries. The adults are primarily for the sashimi- and fresh-fish domestic markets. The juveniles are favored by small households and limited income families for frying, soup and other dishes. While the Pacific yellowfin tuna stock is considered highly migratory, research has indicated that locally spawned yellowfin stay around the Hawaiian Islands. After about 24 inches in length (about 10 pounds), their natural mortality rate drops to its lowest levels. Once reaching this size, the species grows quickly to reproductive size. Currently the commercial minimum size limit for yellowfin set by the State of Hawai`i is 3 pounds. The Fishers Forum will include a discussion of options for minimum size of yellowfin and bigeye tuna for commercial fisheries operating in federal waters around Hawai`i. It can be difficult to distinguish the two species when they are juvenile. The discussion will include federal, State and fishing representatives. The North Pacific striped marlin in the Western and Central Pacific Ocean (WCPO) has been subject to overfishing, and the National Marine Fisheries Service recently announced that it is in an overfished condition. The US fishery for WCPO North Pacific striped marlin is currently limited to 457 metric tons. The longline fishery catches >95 percent of Hawai`i’s striped marlin catch. Troll and handline fisheries typically catch <5 percent of the Hawai`i striped marlin catch with the charter vessel fishery accounting for about 38 percent of the non-longline catch. The Council will consider several options to address the domestic fisheries’ impact to this Pacific-wide problem. The Fishers Forum provides fishers and others who are unable to attend the Council meeting an opportunity to learn about these issues and offer their input into the management decision-making process. It also includes information booths, presentations, panel and public discussions and door prizes. The Western Pacific Regional Fishery Management Council meets Oct. 21 to 23, 2014, 8:30 a.m. to 5 p.m. at the Laniakea YWCA-Fuller Hall, 1040 Richards St., Honolulu. For complete agendas of the Fishers Forum and Council meeting and details on public comment opportunities, go to www.wpcouncil.org/category/upcoming-council-and-advisory-body-meetings/.